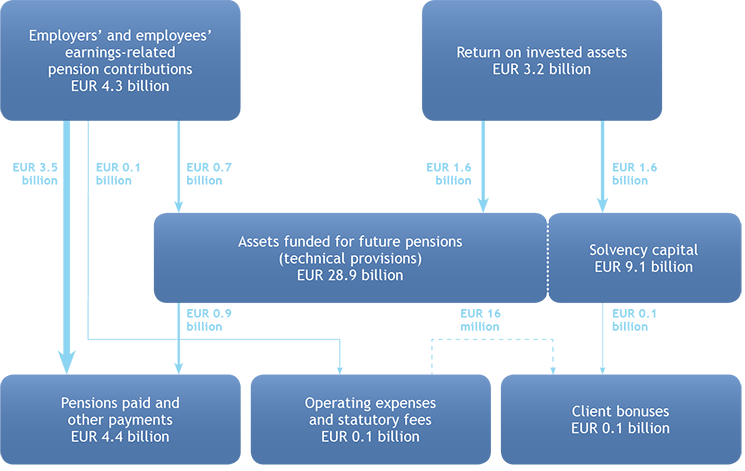 The Finnish statutory earnings-related pension scheme is partially fund-based. The majority of the pension contributions paid by employers and employees are used to pay the pensions for that year. A portion of the contributions is set aside in funds for future pension payments. Approximately a quarter of the pensions under payment are financed through previously collected pension assets and the returns on them. A small portion of the contributions goes towards the operating expenses of the different operators within the earnings-related pension system. By law, pension assets must be invested profitably and securely. Part of the investment returns is used to strengthen pension liabilities and part is used to maintain the solvency of the earnings-related pension company. Based on the solvency and operational efficiency of the pension company, it may grant client bonuses. Varma’s operating expense efficiency and solvency have been extremely competitive for several years. Our high cost efficiency and strong solvency lower our customers’ pension contributions. For several years now Varma’s client companies have benefited from very competitive client bonuses. The YEL contribution paid by those who are self-employed is dedicated entirely to paying pensions for the current year, i.e. the assets are not set aside in funds.